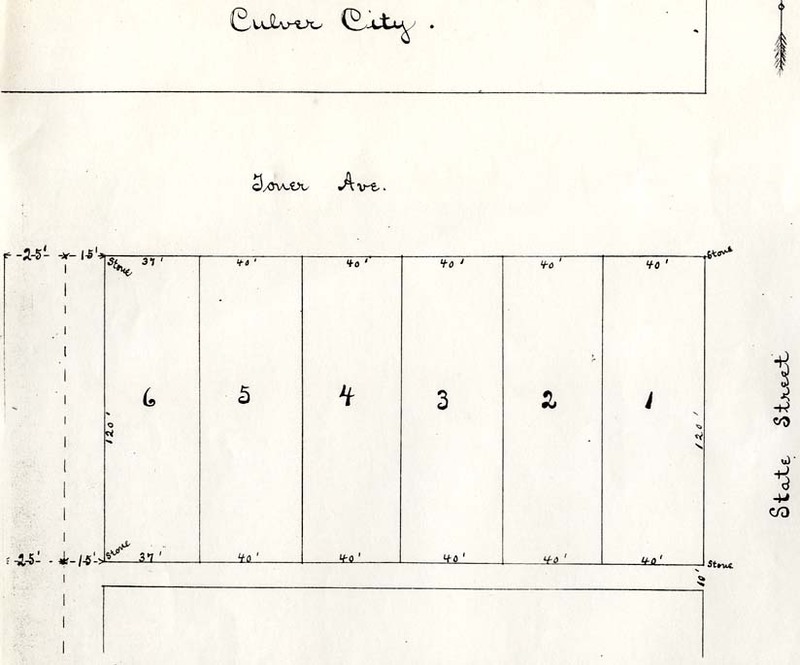 Below are maps of the Culver area, ranging from early historic maps, to entertaining, artistic maps, to more recent maps. 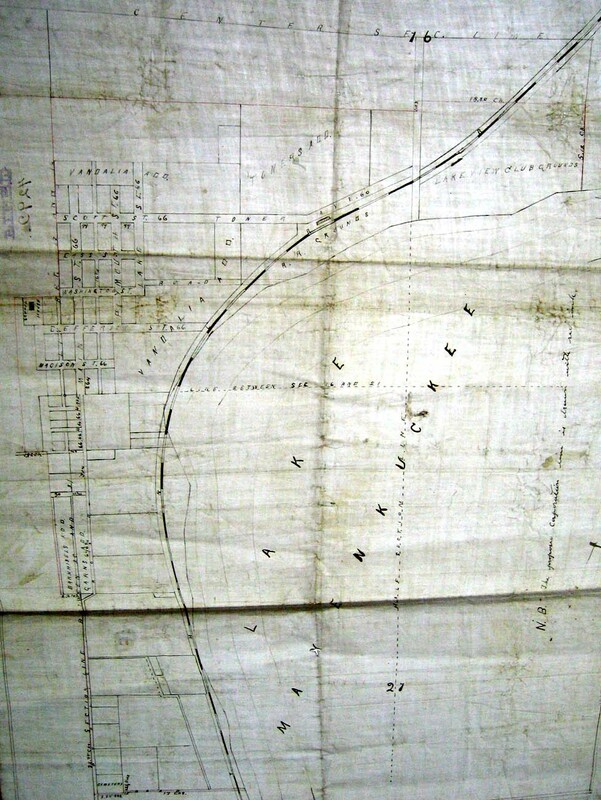 Early 20th century platt map of the Kreuzberger addition, showing land owned by Robert Kreuzberger, whose saloon and hotel occupied land west of today's town park (the main building, made of brick, still stands). 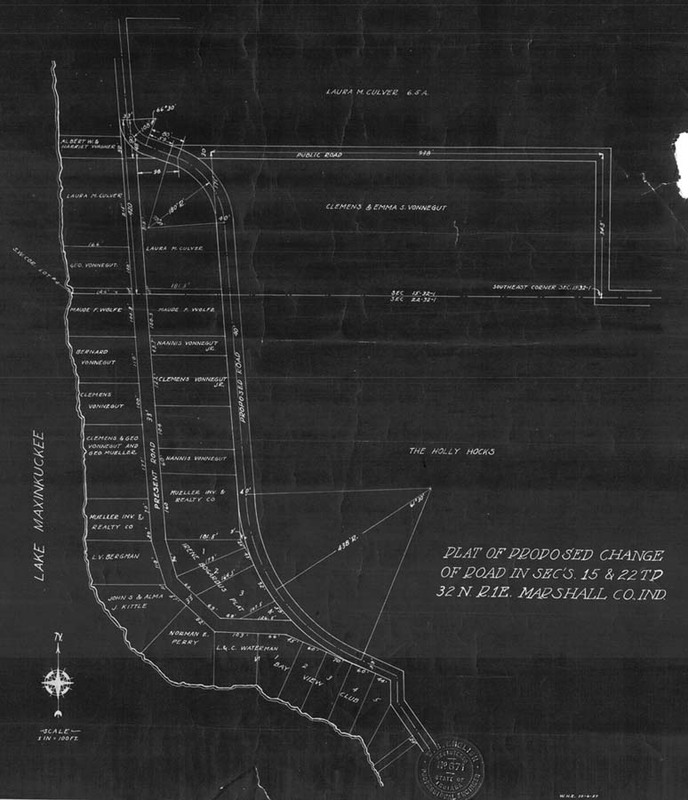 This map shows Lake Shore Drive under its earlier moniker, Toner Avenue. 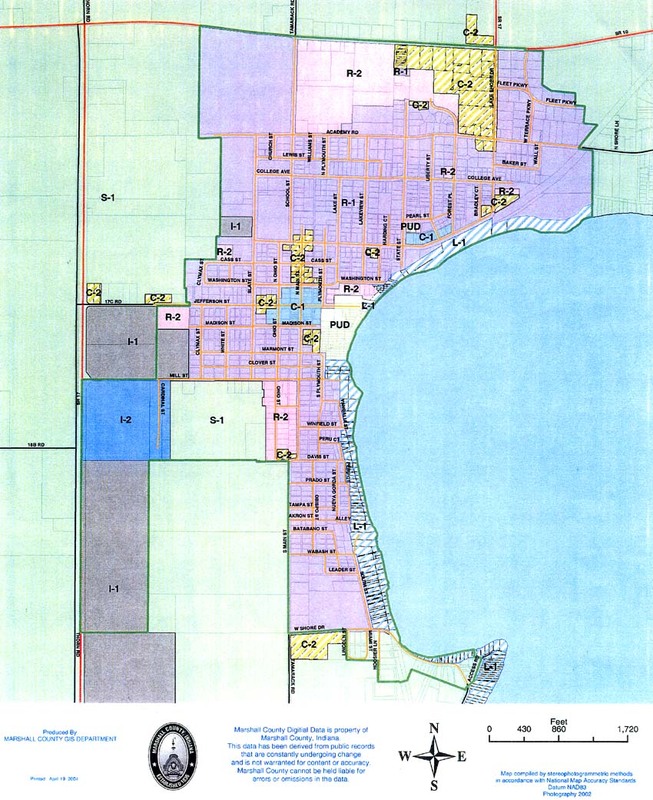 A recent zoning map of the ton of Culver. 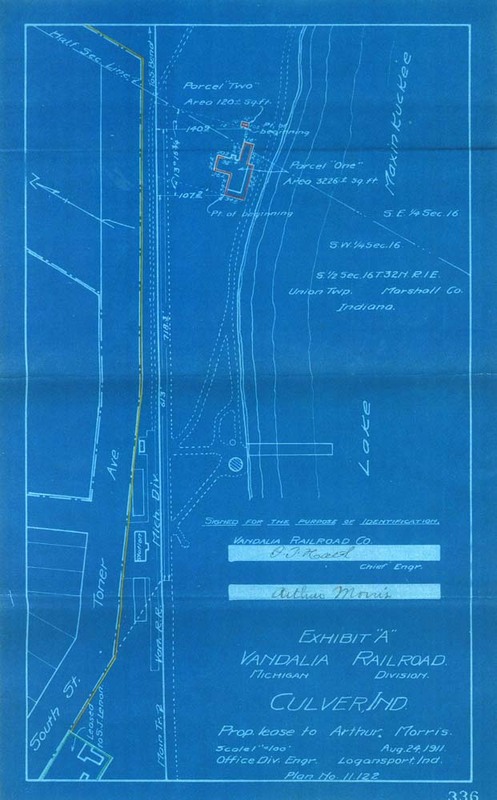 Aug. 24, 1911 plat map of the Vandalia railroad's lease to Arthur Morris which appears to show the railroad line running from just south of the depot/train station up to what appears to be the Lakeview Hotel (in the upper middle of the map. This item was loaned by Jon Schmidt. 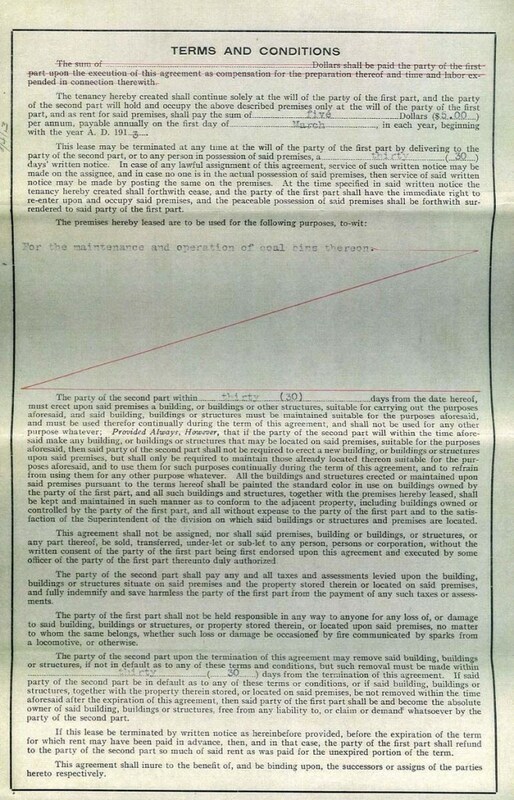 Dated Jan. 21, 1913, this plat map shows the proposed lease to Castleman and Williamson Coal of a piece of land owned by the Vandalia Railroad near Hawkins Court and Plymouth Street. 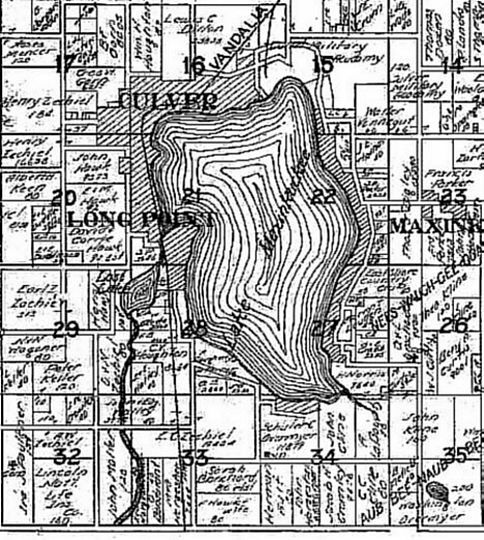 1)A map from the early 1800s of the Lake Maxinkuckee area. The first version has added text to reflect the location of each Indian chief's village/reservation on the lake. A close inspection of the map shows the markings on the original relative to the respective chiefs; and, 2) The same map, without the villages marked. 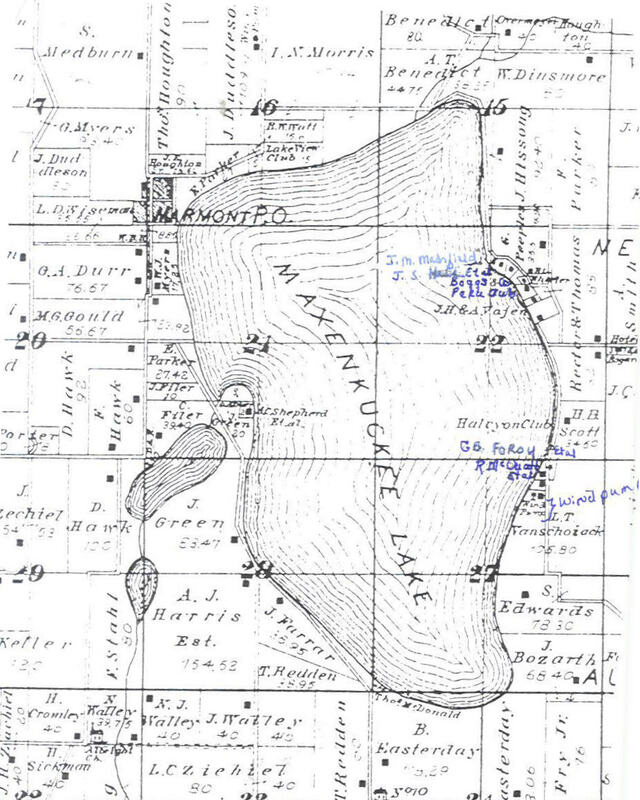 An 1881 map of the Marmont (future Culver) area and Lake Maxinkuckee. 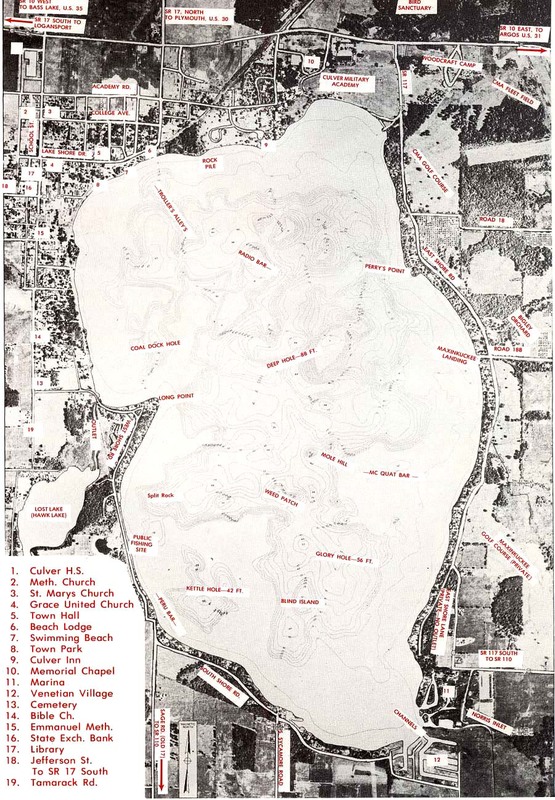 Lake Maxinkuckee from a 1960s tourist brochure. Most interesting about this map is its vivid descriptions of local landmarks and its detailed labeling of the various facets of the Lake's geography. This map might be especially useful for fisherman in light of that. Map of the East Shore Drive historic district, ca. 1980s. Read more about the historic district here. A vintage topographical map of the lake (left hand image is smaller, the right hand image is higher resolution for more detail), more for enjoyment than accuracy! 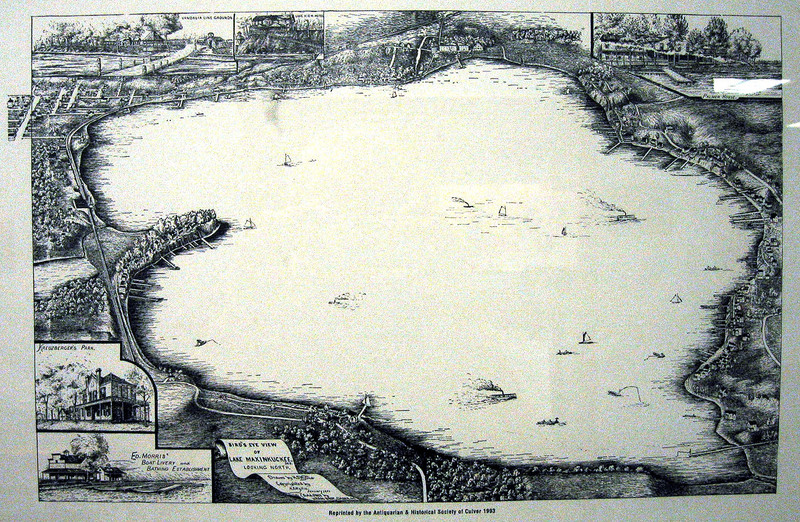 An 1880 Plat map of Lake Maxinkuckee. 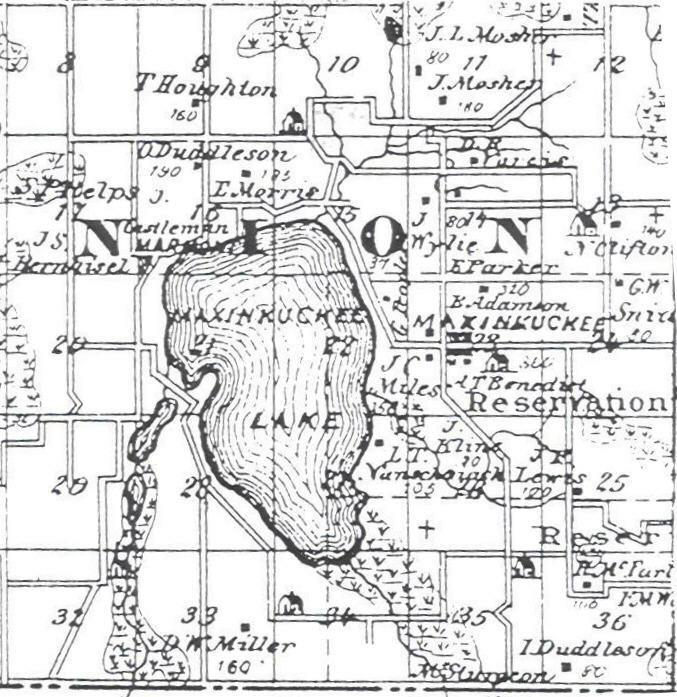 An 1898 map of Lake Maxinkuckee. 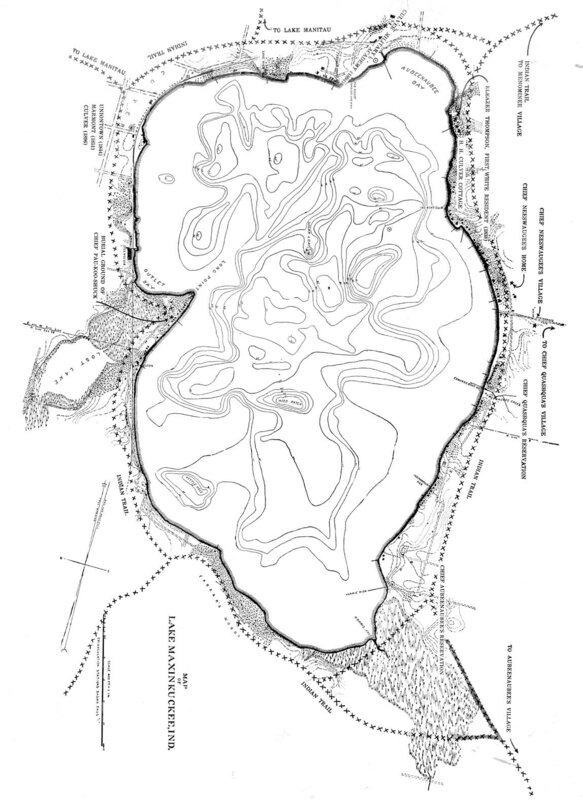 A 1908 map of Lake Maxinkuckee. 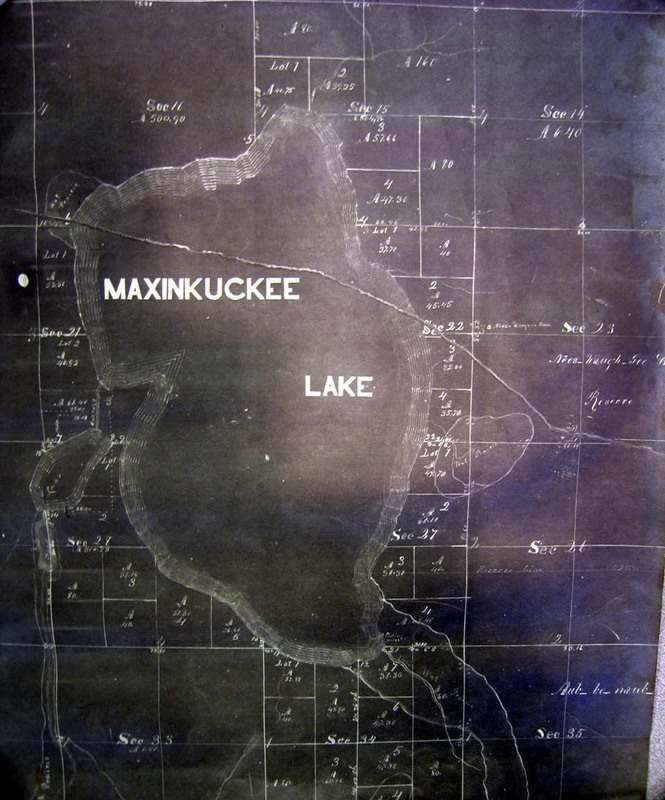 A 1922 map of Lake Maxinkuckee. 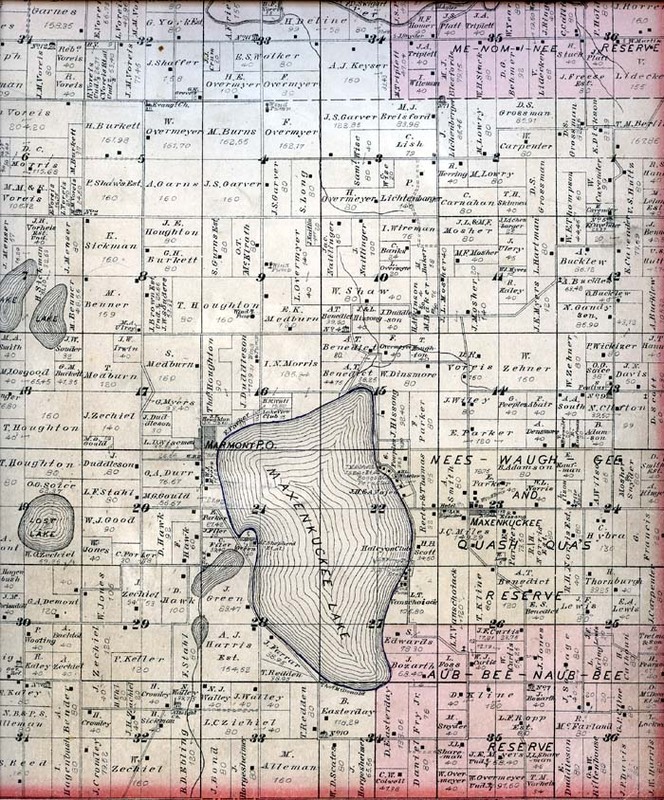 An 1876 Plat map of Lake Maxinkuckee. 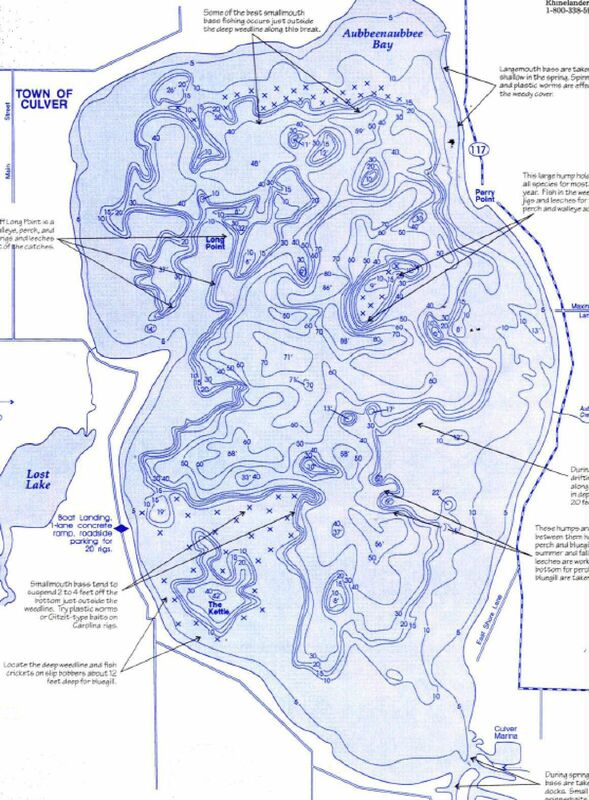 Lake Maxinkuckee Fishing Beds Map, date unknown. 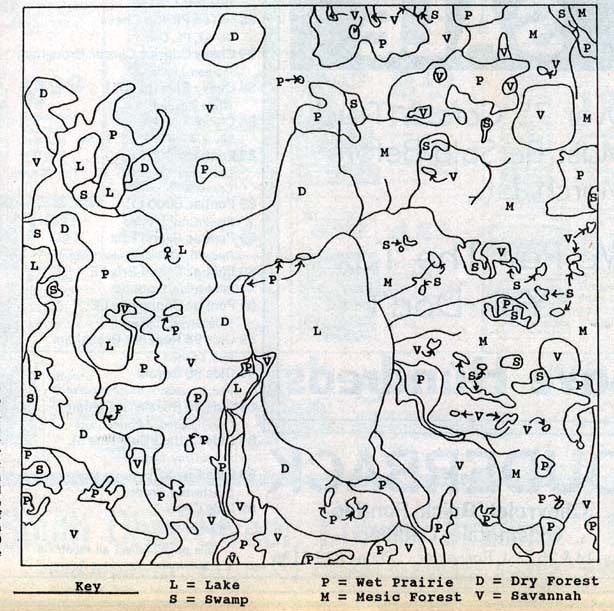 Carl Strang's map of pre-historic Lake Maxinkuckee. Two 1929 plat maps from the Judi Burns collection. At left is a broader view of the surrounding area and at right is a closeup view of Lake Maxinkuckee. 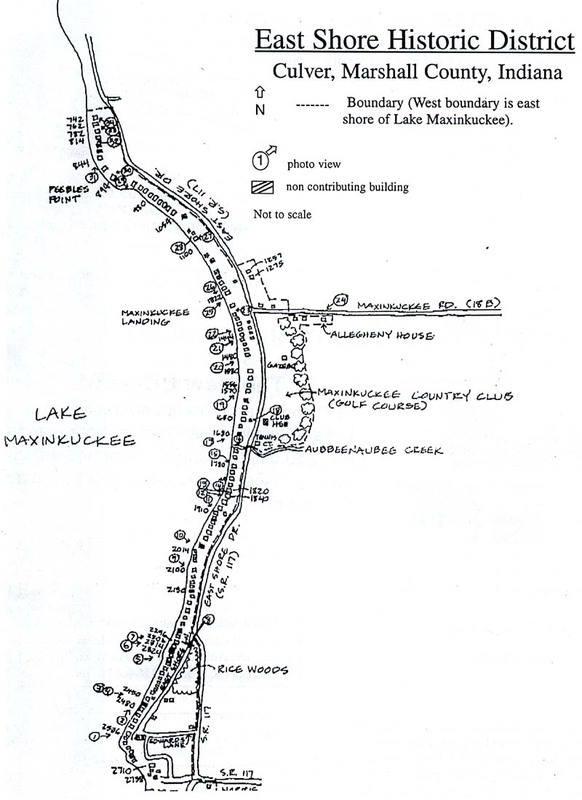 Large (left) and reduced (right) versions of a map showing the proposed changes to the road along the east shore of Lake Maxinkuckee. Originally, a dirt wagon trail ran along the lake (one can still walk this trail between the Culver Academy's main campus and the H.H. Culver homestead cottage across East Shore Drive from the Academy's golf course). 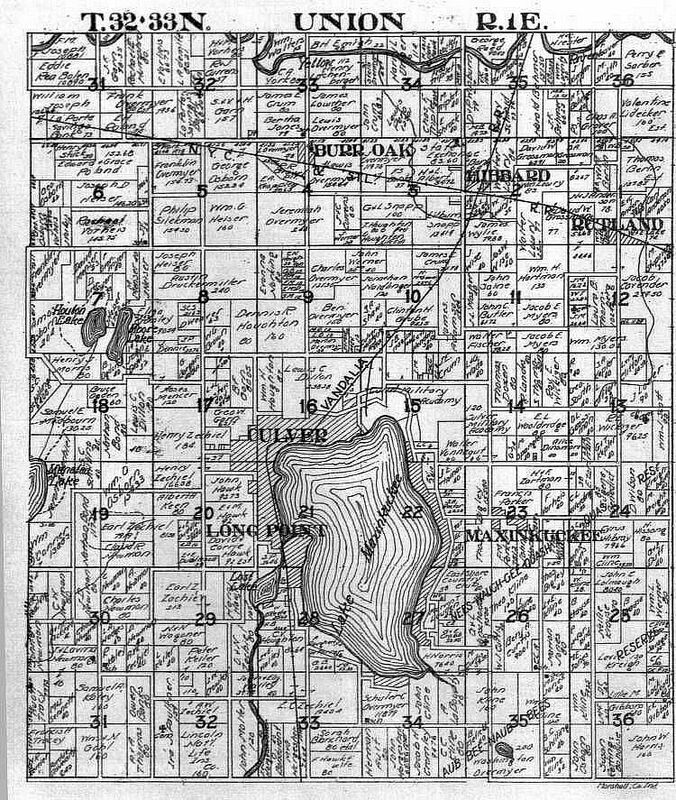 The proposal suggests the road that eventually became East Shore Drive / State Road 117 (the lake itself is to the left on this map). 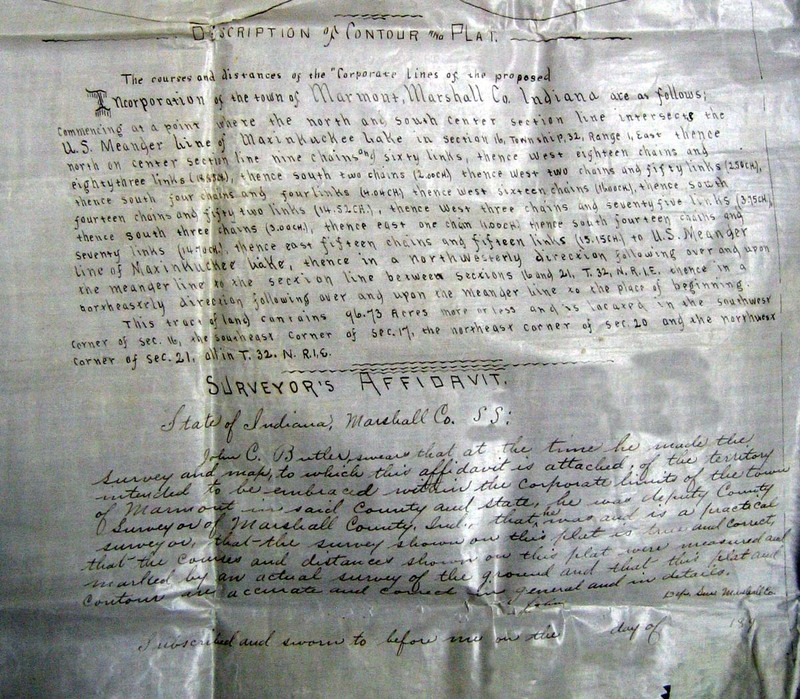 Note the names of property owners around this period (many are Vonneguts), which appears to be 1927, if the apparent date in the lower corner of the map is accurate. 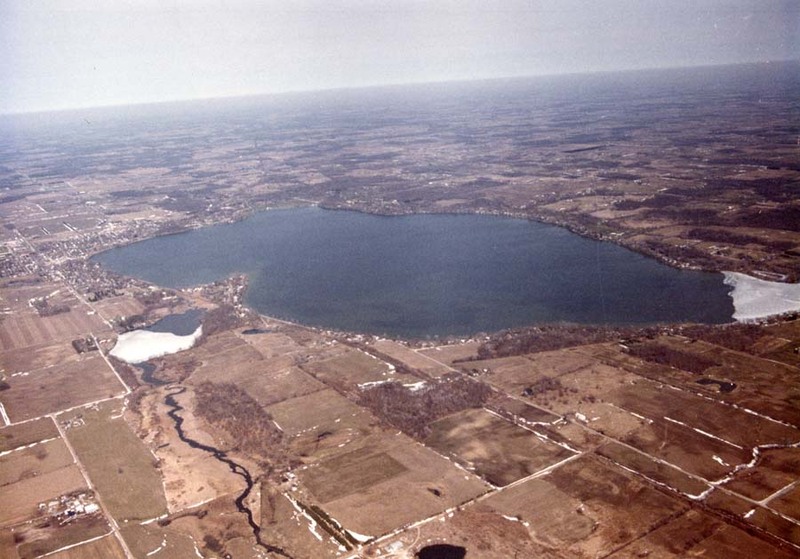 Aerial map photo of Lake Maxinkuckee, undated, probably taken in the 1980s. 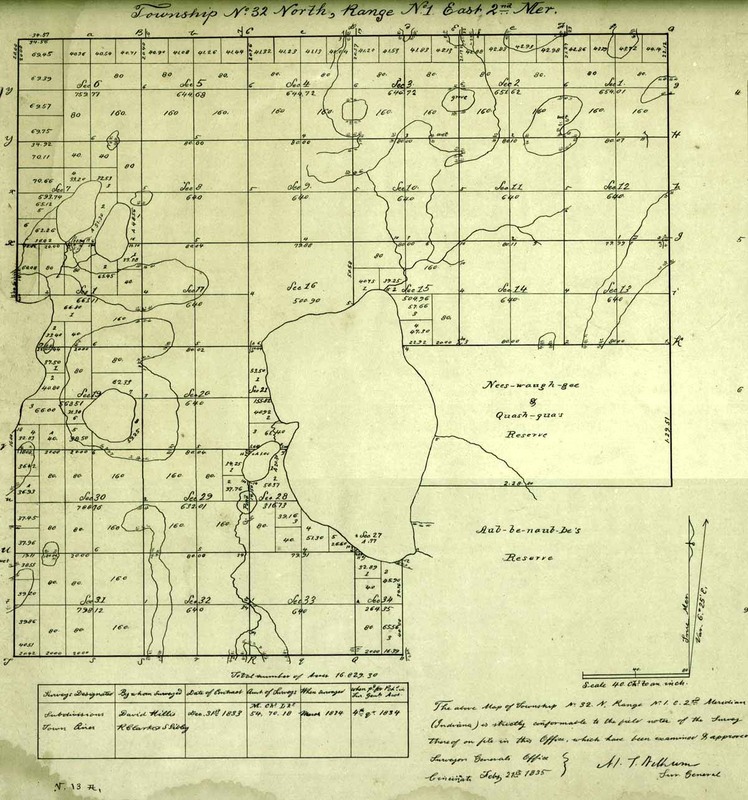 Probably the earliest map of the area, this Union Township map is dated February, 1835 (the year before the pioneers arrived here!). Note the presence, as in other maps, of the Potowatomie Indian reservations. A late 1800s map of Lake Maxinkuckee showing the Indian trails to the various villages and reservations along and near the lake. A fascinating peek into life before and during this early period. 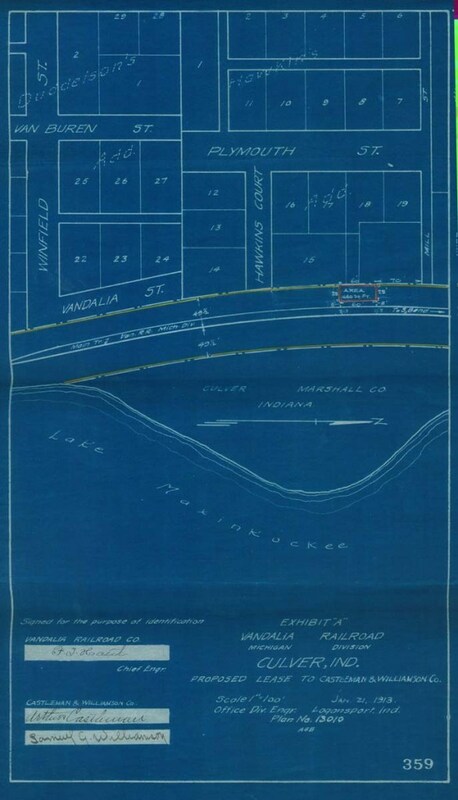 A 1908 plat map of the Maxinkukee Village located on today's 18B Road (then the Maxinkuckee Road) east of the lake on the east shore. 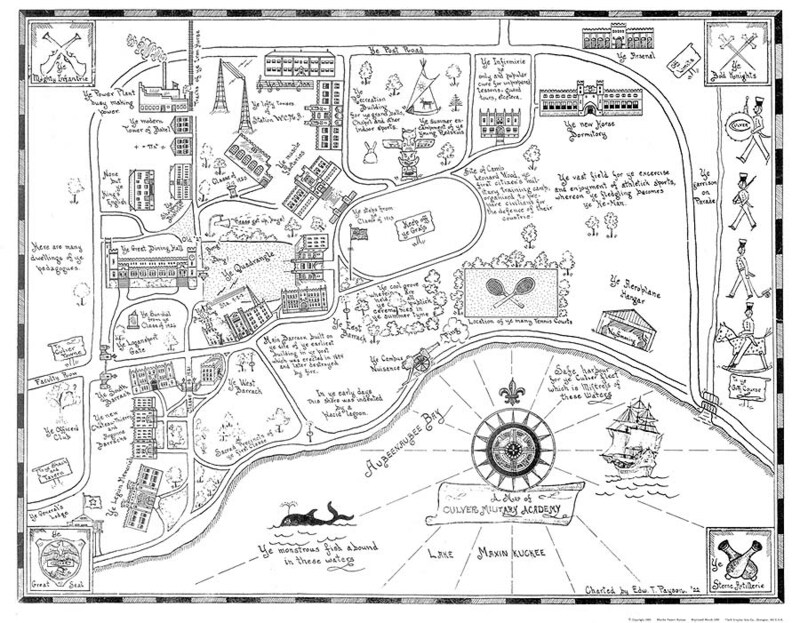 Two versions of Col. Edward Payson's wonderful map of the Academy campus, most enjoyable for its labeling of local landmarks and humorous slant on the landscape. The map at left is lowered resolution, the map at right is higher. Thanks to Martha Payson Ryman, Col. Payson's daughter, for the use of this 1938 map. 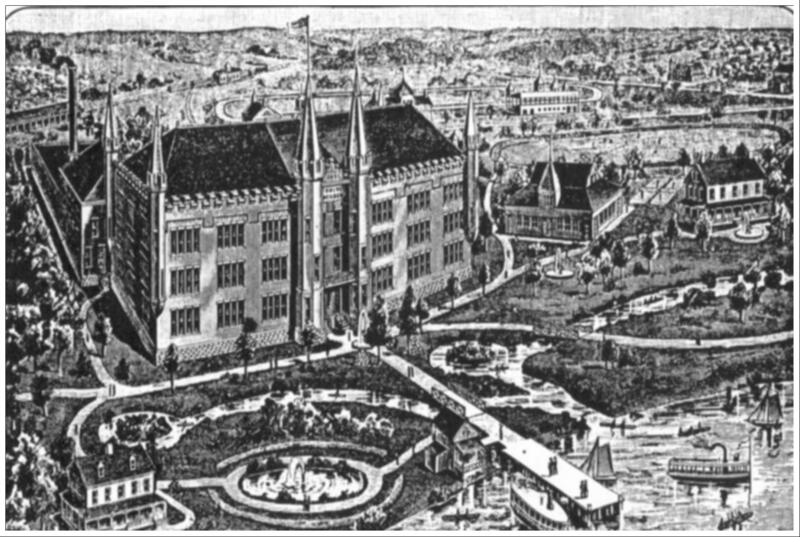 A late 1800s - early 1900s artistic rendering of the Academy campus, notable for its depiction of the long-defunct "moat" system along the shoreline. A modern map of the campus. 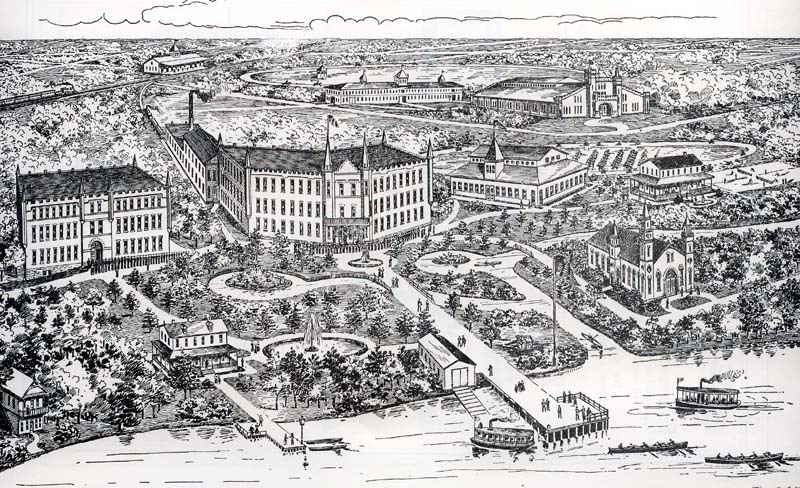 An aerial "map" of the campus from 1898, showing the layout of buildings in great detail. "An Aeroplane View" of CMA, part of a 1937 CMA postcard from Ted Schenberg's collection. 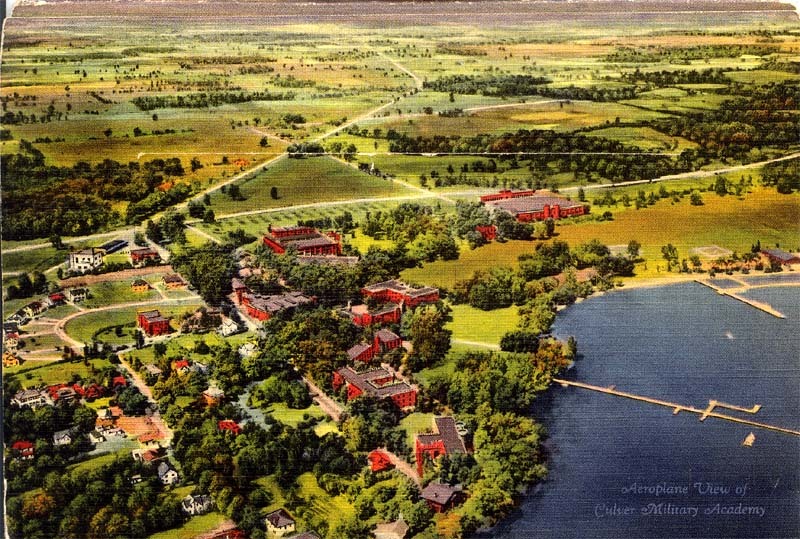 An aerial view of the campus' western portion from the 1920s. At left can be seen the three fish hatchery ponds that once occupied the area near the present site of the Academy motels, just east of the Indian Trails. 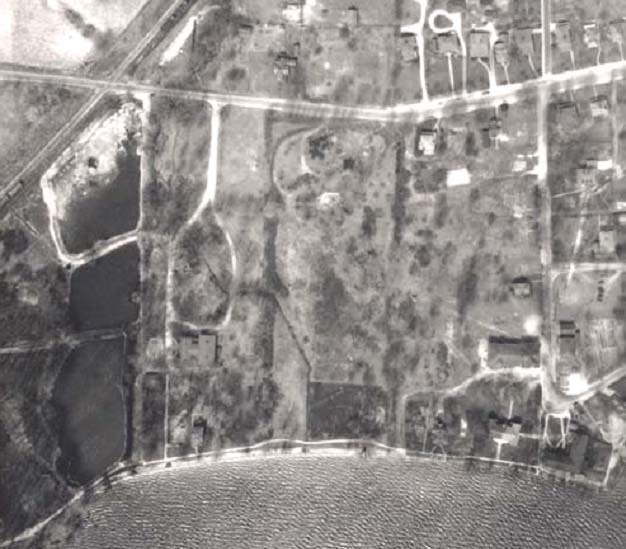 In 1930, that hatchery was filled in and relocated to a location just west of the junction of State Roads 10 and 17 (those ponds are still there). Also visible, just east of the hatchery, is the main lodge and smaller cabins of the Jungle Hotel, torn down in 1930. Further east, on the point, is the Palmer House, later to become the Culver Inn. From Bob Hartman, Academies' archivist. 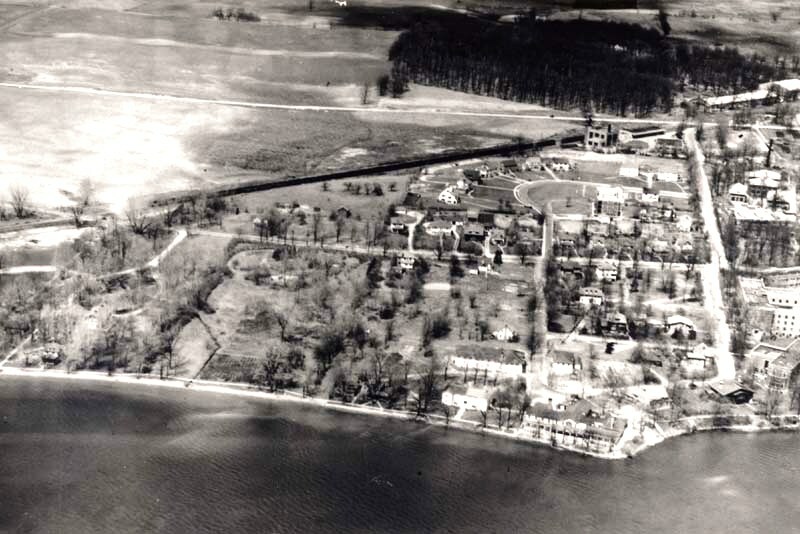 Another aerial view, this one probably from the 1930s, shows a broader perspective that includes the Palmer House on the point, the main buildings of campus, outlaying faculty housing, and a good view of the railroad running diagonally across the top portion of the photo. From Bob Hartman, Academies' archivist.